1. Nino's answer to "If you were a girl, which Arashi member would you date?" From the 2009.04.25 episode of Ousama no Brunch. If you watched this episode, you might recall that before announcing his answer, Nino indicated that the gap between the fourth and fifth places was huge, pulling the chair for the fifth place far out to the end of the stage. Then, he names poor Aiba as the member he would least want to date. And what was Nino's reason for not wanting to date Aiba? And five years later, on the 2014.01.13 Hey Hey Hey here, Nino says almost the exact same thing. The member he'd most want to date changes from Jun to Sho, but the last place is still Aiba, and the reason he gives is still "Urusain desu!" 2. Inoue Mao guests on the Arashi Sharehouse in the 2012.11.22 episode of Himitsu no Arashi-chan, and Aimiya are the hosts. They ask her about her impression of themselves from Kouhaku, which she hosted with Arashi. She says Nino felt dependable and was most proactive in starting conversations with her, and that Aiba seemed to be the shyest (or most awkward around strangers). Aiba sits back and replies, "Aaahhh sou?" while Nino just starts clapping his hands in amusement. "It's rare to find anyone who can notice this about Aiba," he tells Mao, with an air of someone who's an expert in all matters Aiba-related. 3. 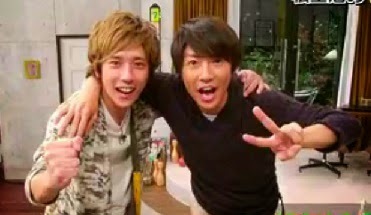 On the 2012.12.13 episode of Himitsu no Arashi-chan, Aimiya were once again paired up to do Sharehouse, and the episode began, as many episodes do, with the camera following them as they leave their green room to go to the set. There was a cute sequence here, because Nino comes out of the green room first, and he purposefully holds the door half-shut so that Aiba wouldn't be able to get out. Aiba squeals something unintelligible, and when he finally makes his way out, he gives Nino a little shove, just like a petulant little boy. He is sooo proud of himself! And he looks around, casts a glance or two in the direction of the kitchen, and is a little bummed that the other two didn't witness this miraculous feat. Kaera seems to notice something, and asks, "What's the matter? Did you just get both in?" Beside her, Aiba's all grinning and teasing: "Oh, come on, that's impossible! He's lying! He's got to be lying!" Nino turns to the camera (or one of the cameras), and yells out indignantly: "Cameraman #4!!! Ne!!!" He wants the cameraman to say a word of evidence for him, but of course, our Neen gets no response. So the skeptical Aiba tells him to repeat the feat. And he gets Kaera to watch Nino closely with him as Nino tries to do it again. Naturally, Nino fails. And Aiba says to Kaera, "See? I told you he was lying!" Then, he turns Nino. "Don't lie when you're on TV!" He scolds his younger friend. Nino just takes it like a good sport, wrapping up his kendamas with an apologetic air. "Sorry," he says. "It's just that being on TV... it kind of makes me want to show off." The audience laughs appreciatively at Nino's magnanimity, and the matter is laid to rest. 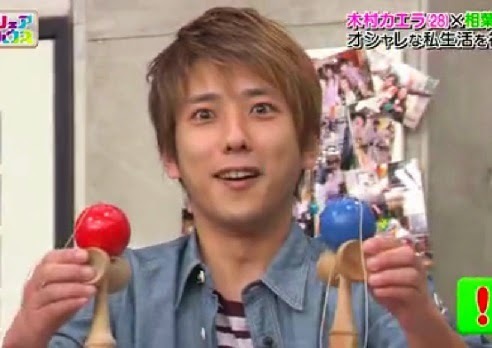 Because as soon as Kaera and Aiba start busying themselves with the kitchen work again, Nino tries to do the kendama trick again. And he succeeds!! But of course, neither of his two colleagues notice. Nino throws himself to the floor in frustration. while the other two begin carrying food-laden trays out, looking mildly perplexed. 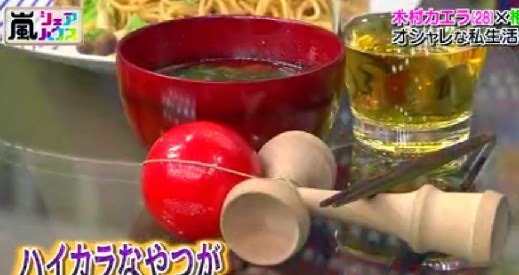 And then, when they finally sit down to eat the wonderful pasta and miso that Kaera has prepared for them, Aiba finds, to his surprise, that his chopsticks stand has been replaced by a... kendama! Nino tells him to stop complaining. The caption tells us that it was Nino's act of mischief. Aiba ends up saying, "It makes quite a pretty sight, doesn't it?" This episode of HnA also featured Ninoai on the Last Mission segment. They had to play Tataittekabutte janken with Akiyama Yoshihiro, who is a former judoka and looks like he has enough muscle to squeeze both Aiba and Nino into little pulps. Aiba has to play against him, and he loses when Akiyama brings the plastic hammer down on the back of his neck with quite some force. Aiba feels the back of his head where the hammer hit and runs over to Nino. "Do I still have hair left on this spot?" He exposes a spot on his head for Nino to see. Nino glides right over and begins examining his bestie's scalp concernedly. "You're fine," he says after his check. Oh Neen... you just love smacking your Aibaby, don't you? Oh, and because Aiba failed twice, he had to perform the "honki no kiss," which is basically a punishment game where he has to mimic kissing an invisible girl. Hehehe... This wasn't his first time doing this, and if I remember correctly, he actually had to do it three times over the course of the show (lol!) But this one was pretty cute, and hilarious, and well.... listening to Aiba's explanation of his pantomime afterwards was side-splitting. I won't cap it here, but I will tell you that afterwards, the announcer asked, "Ninomiya-san, what did you think of it, having seen it at such a close distance?" and Nino answered with a cheerful smile: "It was unbearable to watch." Nino wrote the caption for this as "Buddy from BAD." What the hell is BAD? Haha, I had no idea when I first watched this, either. And neither did Yakkun (the host of Hanamaru Cafe). But Nino explains that it stands for Beautiful American Dream, and it's what the jimusho named the Aiba-Nino combi. 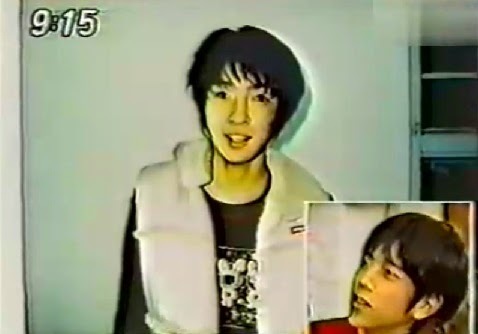 But anyways, I just wanted to share the way that Nino introduced Aiba at first. So when Yakkun first revealed the photo, he was all like, "Whoa, a friend from BAD? That sounds pretty dreadful!" But Nino immediately corrected him. "No, no," he was quick to say. "This person is called Aiba Masaki-kun. As a Junior, he's been with me for a long time... a really long time. About two years, and throughout these two years, he's always been my friend." Now, it's worth noting here that Nino back in 1998 was not quite as full of sass as the Nino we now know, and he sounded a lot more subdued. Though I wouldn't call him shy, I would certainly say that he was a lot less proactive of a speaker back then, and the way he talked about Aiba had this genuine air of innocence to it. It's something very rarely seen in Nino nowadays, because he's grown used to expressing his affection through tsukkomi's rather than directly through words like this (remember how everyone seemed to think his mushy 24 Hr TV letter was so rare? ), so I found it really nice to hear the 15-year-old Nino proudly (but also a little clumsily) showing off his friendship with Aiba Masaki on TV. You can really tell that Nino really treasured this friendship, and if you haven't read his 10000 word interview, translated by say-it-again, you should do so right away! Because in it, he reveals that he was pretty unsociable as a child, and that he really had to work to overcome these barriers. Baseball, and the teamwork that came with it, was what helped him do that. And I guess baseball has just always held a special place in Nino's heart; it's certainly the sport we associate with him most strongly. Now, we all know from other sources that Aiba was very much into playing baseball before he entered Johnny's (and even afterwards, too). It makes me wonder if their shared love of the sport played any role in bringing them on intimate terms with each other when they first met. Nino (on possibly debuting with Aiba, Takki and Tsubasa): "It's too early to tell." The topic turns to trains, and specifically, how Nino takes the train to work just like a regular boy. Nino is quick to bring Aiba back into the conversation as he gestures towards the photo and tells everyone, "But you know, no one really notices us when the two of us in BAD walk on the street together." Yakkun is surprised, and he asks later, "Aren't there times like when you're riding the train and you'd hear girls saying, 'Ah! It's Ninomiya-kun!'?" Ninomiya replies, "No. Not at all on trains." He gestures again to Aiba's picture on the board and continues, again bringing his partner back into the conversation. "The two of us would sit side by side like this the entire time, and the people right beside us would just get off the train normally." Yakkun then says, "It's all right to have girls come up to talk to you, but it'd be pretty scary to have a yanki approach you, wouldn't it?" Nino reveals that he's actually been approached by a yanki once, and that he seems to attract the attention of these types of people when he's alone. "It doesn't happen when it's the two of us together, but when he [Aiba] has work and I'm all alone, like when I have to go home before him... 'I'm leaving first!' I'd say, and then those sorts of people will just come right up like gaaahh! 'You're Ninomiya, aren't you?' they asked me, and I just answered, 'No, you've got the wrong person.' I walked away after that, and they let me!" (The original Japanese for what the yankis say to Nino is kind of casual and maybe even a bit rude: 「お前、二宮じゃん？」 And Nino's answer is 「いや、違います」which is more polite). All of the members have guested on Hanamaru Cafe several times, and if you haven't watched these interviews, I highly recommend them, because Yakkun really asks about personal things, and it's actually through this show that I learned most of what I know about the members' families. It was on this show that Aiba revealed that his younger brother was a Sho fanboy, and here that Sho revealed how his mother would scold him and how his father began smoking outdoors when his younger brother was born. It was also here that Jun talks about how awkward it was to go on an onsen trip with his parents (lol!) and here that Ohno revealed how he just kept waving at his mother (who was standing outside the window waving back) during his Johnny's audition. And in addition to all the family details, the members also talk quite a lot about each other (usually at least one of the photos they bring onto the show has something to do with the members, and at least one other will be something to do with their families). 5. Nino guested on Hanamaru Cafe again on 2007.07.06, and in this episode he talks about quite a few interesting things, including his experience in Hollywood (apparently, Watanabe Ken would hand-make onigiris and deliver them to Ninomiya's trailer when he didn't have filming!) and a cute little picture that all the child actors in Yamada Taro Monogatari drew for him as a birthday present. But since this is an Aimiya post, I'll stick to something Nino said that had me thinking along Aimiya lines. Nino was talking about how the child actors in YTM were all pretty casual with him, and treated him as if he was one of their classmates instead of a senpai. Yakkun pointed out that Nino seemed to get on very well with kids, and Nino then reveals that when he met Yakkun's whole family in Hawaii once, Yakkun's kids were all super respectful to Jun (who was there, too) and asked for his autograph using keigo. But when they came back to Nino, their tones changed and they were like, 「おい、お前プロレスやろうぜ！」("Oi! You! Let's wrestle!"). Nino on Yakkun's son: "He wrestled with me like this!" Oh haha ^.^ Poor Neen... Of course, the first thing I thought of when I saw this interview was all those instances when kids called Aiba without honorifics. Remember that episode of Himitsu no Arashi where Sakuraiba took Kuroki Hitomi out on the VIP Limousine (aired 2012.02.02)? They came across two schoolboys on the street. Aiba (to the boys): Do you know our names, by the way? Aiba & Kuroki (impressed): Whoooaa! Both boys (in unison): Sakurai Sho-san. Aiba (leaning forward): And what about me? Everyone laughs. And Aiba yells, "Kuso!!" And he playfully squeezes the bold little boy's chin. It was the cutest thing ever. 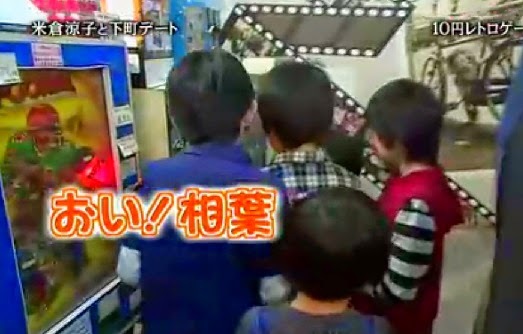 Aiba-chan is always so great with kids. And of course, this isn't even the only time that the issue of him being on honorific-less terms with kids has come up. Jun whispers something into the ear of one of the boys while Aiba is occupied with the others. The boy then goes up to the group and says quite clearly, "Oi! Aiba!" Yonekura and Jun are both grinning silently behind them. 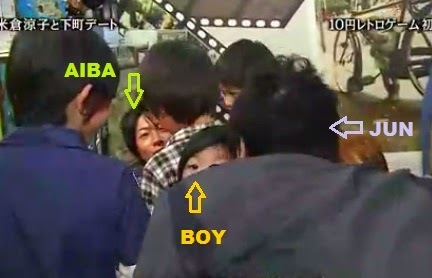 Aiba turns to the boy. "What did you just say? Say it again?" "Did you get more coins? Aiba." The boy doesn't use keigo here, and I think he's making fun of Aiba, too, because not getting coins meant that Aiba was losing whatever game he was playing. "Hey, hey, I may not have gotten more coins, but first things first... You should be calling me 'Aiba-kun!' Got it?" The boys are sort of smiling, but not saying anything. So Aiba goes on to ask them how old they are. "How old are you? How old are you?" 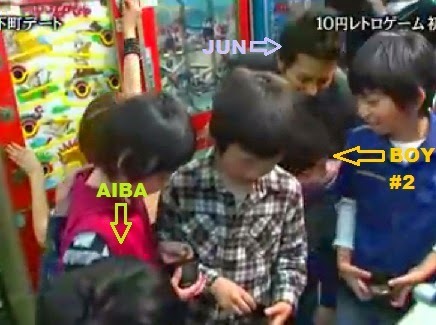 Aiba's trying to keep the show going, but in the back, the camera catches Jun sneaking another whisper into a boy's ear. 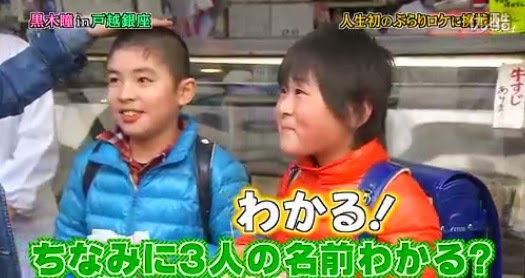 "I'm eight," answers one of the boys to Aiba. Aiba's just like "Eee?" for a second. The boy repeats himself, to the laughter of everyone. 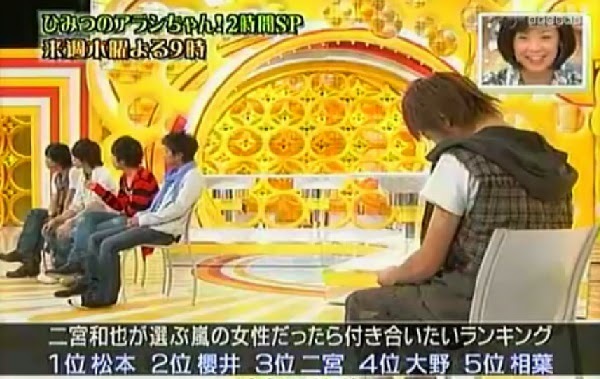 Aiba crosses his arms and tries to justify himself. "Of course, I'm not super worked up about this... I'm not worked up, but still... Which elementary school are you from, anyway?!" 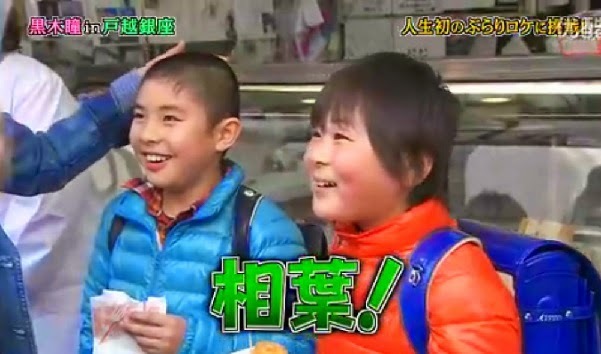 And I'm not even going to go into how Aiba has a reputation for being addressed as simply "Aiba" by little kids. It's been mentioned in ranking derby, it's been mentioned during Shiyagare, it's even been adopted into a gag in the Atamari Taisou. It's quite interesting that both Nino and Aiba have such an approachable image with children, isn't it? I was actually a bit surprised that Nino had that image, too, but I guess he was quite charming with the cast of YTM, after all. 6. Aimiya hosted the newly married trio of female guests in the Arashi Sharehouse on the 2012.06.14 episode of HnA. And they got around to talking about what defines cheating in a relationship. Does holding hands count? What about an arm around the shoulders? Nino and Aiba, of course, cannot pass up the opportunity to have some fun with each other, so they decide to act out a scenario that might or might not count as cheating. And what really gets me is that, neither of them really had to even ask out loud for the other to do this act. Aiba just naturally stood up and Nino just naturally came down from where he was sitting on the stairs, and they just naturally found each other's arms and shoulders. "What counts as cheating should depend on the circumstance, right?" they try to make this point to the three guests. "Like if they were drunk, and had an arm around each other's shoulders, that should be okay, right?" They laugh merrily, and Nino points at Suzanne with mock indignance. But they soon calm down, arms still around each other's shoulders, and Aiba points to Nino. "You're the man, okay?" (❤.❤) is probably the best description of my face at this point. The guests continue to prepare food, and Aiba is getting a bit bored, so he comes up with an impromptu bowling game while Nino watches him set it up lazily from the couch. I just love the casual brotherly atmosphere between the two, like they're so intimate they don't even have to try with each other anymore. To make things interesting, Nino proposes that the loser of the bowling game will not get to eat the food the guests are cooking. Aiba agrees, and promptly hits a perfect strike. Nino's up next, and he fails to knock all three pins down, so he loses. He is very distraught, but Aiba's already cleaning things up and saying, "Well, well, a game's a game. You can't go back on your word." 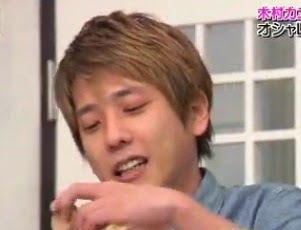 He goes over to the guests in the kitchen and tells them not to prepare food for Nino. Poor Nino yells from the living room, "No, I'll eat, I'll eat!" The gentle-hearted guests are all sympathetic and try to convince Aiba to let Nino eat. Aiba doesn't put up much of a fight. In fact, he seems pacified relatively quickly, and agrees to let Nino eat almost right away. However... Aiba's actions suggest that Nino is anything but let off the hook so easily. Silently, Aiba opens the fridge and pours a glass of the infamous Aiba tea. Without another word, he hands it to Nino, who takes one look at it and immediately knows what Aiba wants. Nino (to Aiba): Sensei, how many times the normal serving amount did you put into this glass? 7. On the 2009.02.14 episode of VS Arashi, Aiba lost the game of janken and ended up having to climb the cliff. In a bout of generosity, Arashi had decided to give their two female golfer guests an advantage by taking out five of the grips on the cliff during Aiba's climb. Aiba, with the support of Sakurai, managed to still clear the top and grab loads more points than the guest team. As he stands on the top of the cliff victoriously, everyone cheers for him, and amid the applause, Nino yells out, "Subarashii, Omame-chan!" Note: According to the subbers of the video I watched, Omame-chan is a nickname for a Morning Musume character. I don't know what Omame-chan's characteristics are supposed to be like, but the name literally means little Bean-chan, so I'm guessing it's something cute. And actually, this episode of VSA had a continuation episode. The next aired VSA (aired 2009.02.21) featured the same two female golfers playing against Arashi in a game of three-hole golf with a virtual green simulator. The only Arashi with real golfing experience was Aiba, and he did pretty well in the golfing game. Surprisingly enough, the only other Arashi to give a half-decent performance was Nino. Hehe, omigoto, Soubusen Power!! And this gif is just because I couldn't resist making a gif out of it after I saw it. It's basically Nino being cocky after he surprisingly swings like 250 yards on his first try. Ito-san says, "You're pretty surprised at how well you did, too, aren't you?" And Nino just replies like it's no big deal (in the gif): "Nah, I usually swing about a 400." Shrug, shrug, sooooo cocky, but sooo Nino. Later, it was determined that Aiba actually won the driving round, as neither of the pro golfers could hit it as far as him (surprisingly). Aiba tries to be all cocky too, and says to the golfer ladies, "Next time I can teach you guys a few things!" Neither of the golfers are impressed, because you know, Aiba just sounds like a happy little kid after wining a contest. He was nothing like that Nino gif above. Sho smacks him. And Nino tells the camera, "See, even his comments are like Omame-chan!" Aiba just giggles in his thin giggly voice, and tries to avoid more smacks from Sho. 8. 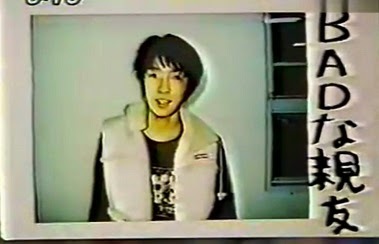 During the 2009.05.09 episode of VS Arashi, Aiba was up for Bank Bowling. Sho then remarks that Aiba seems to be rather good at bowling. Aiba replies that yes, he does indeed have a liking for the sport. And then, Nino jumps right in to brag, "He throws some really, really fast balls!! I mean it, really, really fast! If everyone here were to bowl a ball right now at the same time, his would be the first to hit the pins!" Thank you for the post. Huge Nino fan here so I always enjoy all your work about Nino. Love reading posts like this that reminisce past moments that makes Arashi special. Thank you for going in depth. The accounts of how Nino and Aiba used to walk home together reminded me of the recent 24 hour special where Aiba said Nino was the one out of Arashi to get lonely. His reasoning was that Nino would call him up to eat dinner over at Aiba's house. Nino's excuse was that he knew Aiba would make too much food for just himself. Apparently this happened twice lol.